The Silverstream Charolais Stud operation was established in 1968 when Charolais beef cattle were first introduced in New Zealand. Bruce and Maureen were at that stage dairy farming with an interest in beef cattle as a sideline. 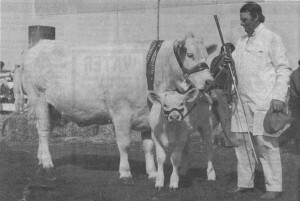 By the late 1970’s the Fishers had 60 Charolais in addition to their herd of 70 Friesians. They also had many successes in beef competitions. By 1978 Bruce was elected to council of the New Zealand Charolais Breeders Association. Maureen was just as keen to popularise the Charolais breed just as much as Bruce so through the 70’s and 80’s they entered many shows and beef competitions to help promote the breed. All the Silverstream bloodlines originate from the Brookfield Charolais herd. In 1983 Bruce and Maureen went to St Andrews in South Canterbury to see the Copeland’s Brookfield herd and were very impressed with the cattle. They felt they were far superior to their own graded up cows. The Copeland’s were unable to continue farming their stud. Bruce and Maureen leased (and later purchased) the 70 females that made up the Brookfield herd. Among them were some very significant females including Brookfield Ocelot who would be regarded as one of the most influential cows in the world. She was the dam of Silverstream Ulverstone, Silverstream Vance, Silverstream Executive, Silverstream Jonah, the grand dam of Silverstream Performer. After purchasing the Brookfield herd all of Bruce and Maureen’s own graded up cows were sold.